Do you want to attack the Rubicon, but desire something less pedestrian than a Jeep? Well, Nice Price or Crack Pipe has a Land Rover that might bowl you over. There was a lot of argument over the merits of yesterday's XR4Ti, but there was general consensus that it really needed the bi-plane rear spoiler to seal the deal. Today we're doing short arm inspection on another European immigrant. This Land Rover D90 represents a recent frame-off refurbishing. While that means that everything has had a look, and a fresh coat of English white applied, it doesn't mean that the trucklette is restored to factory-fresh condition. The seller claims it to be registered as a '69, but as it shares both front clip and former Buick V8 with a much more modern version, it competes with Angelyne for concealment of its true age. Additionally, the restoration only went as far as providing for occasional summer happy, happy, fun-time driving as a top, roll bar, and full complement of gauges didn't factor in. Regardless, the D90 (93 inch wheelbase) is claimed complete enough to drive home. The name of this Land Rover reflects its piecemeal restoration. 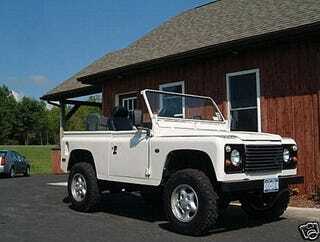 The Defender model is a continuation of the Land Rover Ninety, the 1983 debutant which diverged from the precedent Series III by the adoption of coil springs all the way around. A true '69 would be a series IIA with leaf springs and a likely 2.25 litre diesel engine. While the headlamps did move to positions in the wings that year, those said wings extended past the bonnet on the IIA. This amalgamation, while a '69 in the eyes of the DMV, is really a much more modern vehicle, which weighs in its favor. But is that price also in its favor? A washington shy of twelve grand may seem a lot for a summer time jitney, but Defenders are more dear than their American CJ Jeep cousins, and looking at Defender prices indicate a typically higher levy. So what do you think about this puzzle-piece Land Rover? Does $11,999 make this Defender a contender? Or is that price so Crack Pipe this D90 could have been found in DJ-AM's apartment?